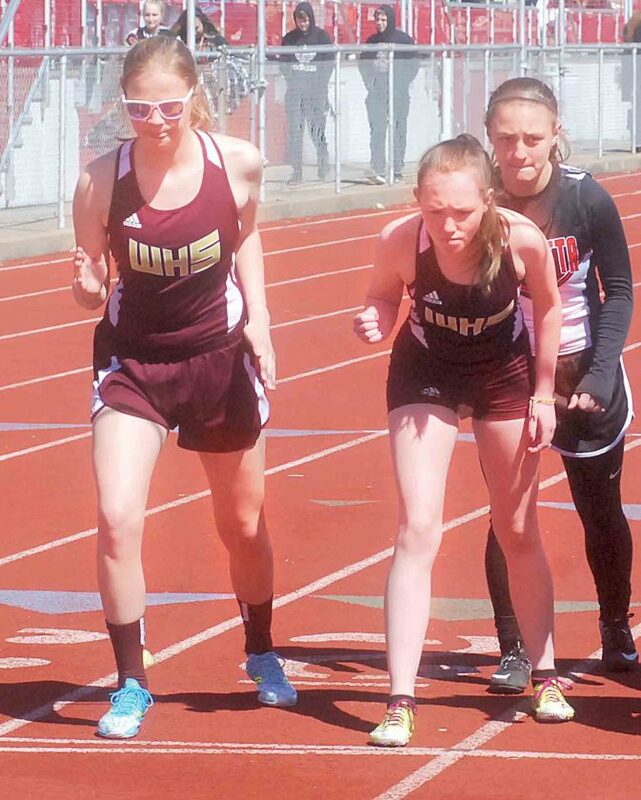 Photo by Josh Hughes Williamstown’s Emilee Ellison (in the glasses) and teammate Stella Flanagin line up before the gun sounds for the 3200 during the Ryan Jobes Invite Saturday at PHS Stadium Field. 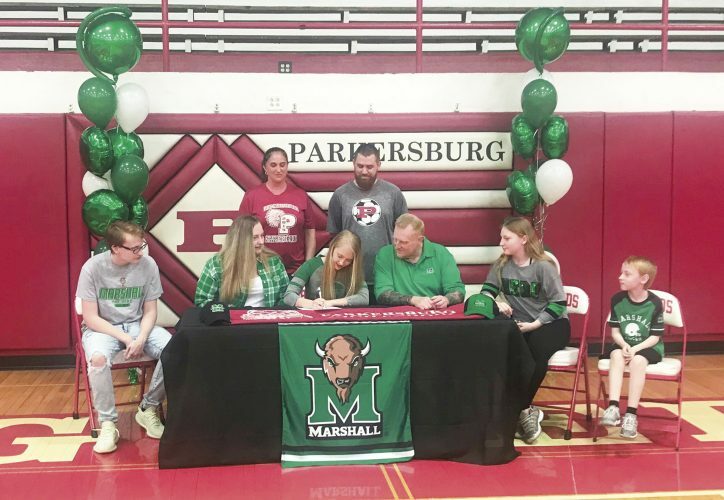 PARKERSBURG — The 2019 Ryan Jobes Invitational at PHS Stadium Field is in the books, and local teams had quite the time with local placers in several events. In girls’ action, Williamstown took the top spot in total team points. With 136 points, they toppled runner-up Ritchie County by 41, but it is how that feat was accomplished that puts it in perspective. The Yellowjackets got started with a bang, as the team of Sydney Zide, Camryn Irvin, Lilly McMullen and Ella McMullen took home first in the 4×100 relay. They bested second place Ritchie County by four seconds. That same Williamstown group won in the 4×400, as well. The second win of the day for the Maroon and Yellow came via a triumph in the 4×102.5 Shuttle Hurdle relay. The quartet of Kenzie Hill, Carsen Hesson, Taylor Modesitt and Jillian Modesitt edged Magnolia by two seconds. Ella Hesson continued the trend for the ‘Jackets, as she topped a group of University runners in the 3200 by a wide margin. Three of the next four placers in the event represented University High, including Emma Troischt and Abigail Murray in a dead heat for second place. Troischt got the better of Murray by .16 seconds. Unfortunately for the ‘Jackets, they couldn’t complete a relay sweep. University blazed past the second place WHS team by over 12 seconds in the 4×800 relay. Lilly McMullen of Williamstown outlasted Paden City’s Abbe Stackpole in the 200 and claimed victory by less than a second. 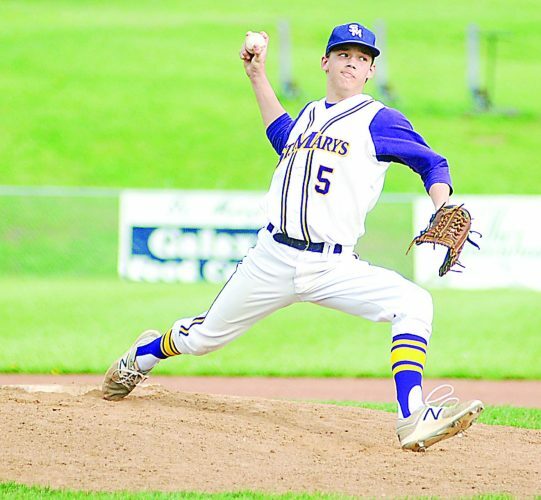 That marked another win for coach Zach Hall’s team, and it helped keep other team’s at arms-length throughout the day. Fortunately for Stackpole, She finished atop the 100-meter dash with a time of 13.14. Sierra Lanham of University and Meadow Benton of Marietta rounded out the top three in the event. 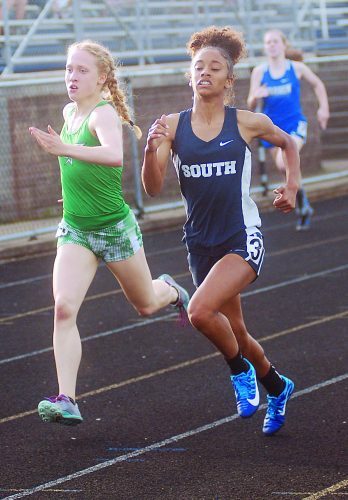 The Hawks finally got in the individual win column thanks to a win in the 400 from Kendall Ours. 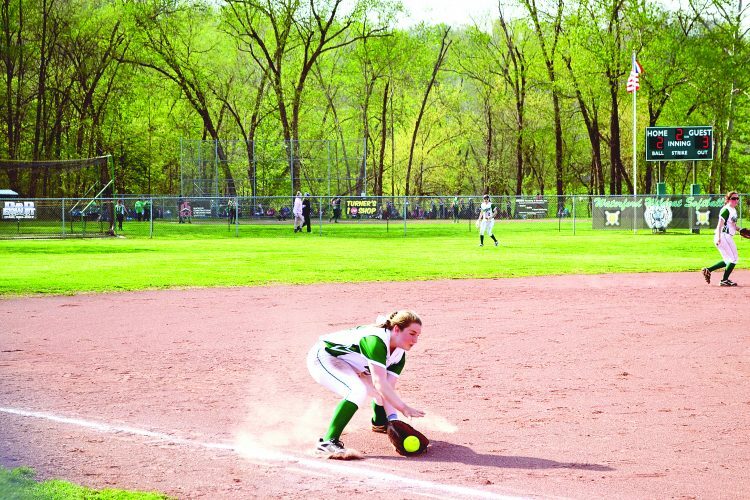 She clocked in at a second and a half faster than Ritchie County freshman Olivia Cress. 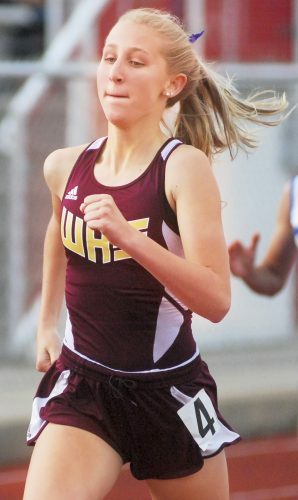 University struck again, as Caroline Kirby beat Williamstown’s Hesson in the 800. Kirby scored her second win on the day, beating Hermoine Vos in the 1600. Both hurdles events were won by Ritchie County runners, with Cress winning in the 100 and Abi Haught taking the top spot in the 300. Cress continued her Jobes debut with a winning 5-foot jump in the high jump. 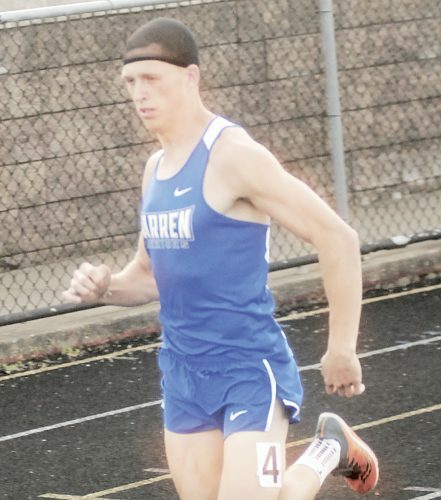 A pair of Marietta Tigers won in the long and high jumps, as Baylee Brown vaulted 10 feet in the pole vault, and Torrence Nonnenmacher won with a 16-feet, 7 inch long jump. That jump from Nonnenmacher breaks a 22-year Ryan Jobes invitational record set with a jump of 16 feet, 4 inches. Williamstown’s Bethany Arnold finished 2nd in the shot put to Mady Winters of Magnolia. Winters bested Arnold by almost 5 feet of difference with a length of 36 feet. The discus was just out of WHS’s reach, as Elizabeth Newton finished in 2nd to Magnolia’s Kyndra Pilant. However, the damage was already done. The Yellowjacket girls’ finished with the all-important team victory at the end of the day. The Rebels got their revenge against the Yellowjackets in the boys’ team total, as they ran away with a total of 162.33 points to 2nd place Williamstown’s 80.5. Things looked good early for Williamstown and Marietta, as three Yellowjackets and two Tigers placed in the 100. However, Justin Louis of University got the win over Williamstown’s Nick Bondi, nipping him at the finish by just .04 seconds. Chase Steele got Gilmer County on the board with a photo finish in the 200. He won by the slimmest of margins over Magnolia’s Jason Beisel by .01 seconds with a winning time of 24.03. For the eventual winners, Ritchie’s Gus Morrison broke through and won in the 400 over Isaak Mooney of St. Marys. Then, positive results started pouring in for the Rebels. Jarett Allender finished 2nd to University’s Larry Edwards in th 800. Another Edwards win, this time from Gary Edwards, gave the Hawks another win, but Ritchie’s Clayton Bee and Brady Layman grabbed the next two spots to close out the 1600. Thomas Jordan claimed the 3rd University win in a row, as he won in the 3200 over Ritchie’s Kent Bee and Issac Slater in 10:36.05. Griffin Setterstrom (18.34) of Marietta finished 2nd to Independence’s Kaleb Mills (17.42) in the 110 meter hurdles, and he recorded another top-3 finish in the 300 hurdles behind Wirt County’s Joey Schmidt and the winner, Morrison of Ritchie County. Ritchie bit Williamstown once again, as their team of Trey Moss, Trenton Richards, Anthony Rader and Gabe Ray bested the ‘Jackets in the 4×100 relay by just under a second. Williamstown would repeat another 2nd place finish in the 4×200, falling to Magnolia. The Blue Eagles claimed another relay win with a 3:40.72 performance in the 4×400 over Ritchie County. Ritchie cemented its lead in the team score with another runner-up finish. This one in the 4×800 to University. For good measure, they took the top spot in the 4×110 shuttles with the winning team of Damion Trader, Marlon Moore, Creed Night and Blaine Bowie. St. Marys’ Mooney soared to victory in the high jump over Williamstown’s Joel Bindley by two inches with an event-winning 5 feet, 8 inch jump. Caden Tallman lived up to his name with a vault of 10 feet in the pole vault, but Allender of Ritchie County topped him by six inches. Marietta’s Quintin Southerly came in 2nd to Gilmer’s Steele in the long jump. In what was the second win for Steele, he finished with a height of 20 feet and 9.5 inches. Ritchie County’s Brandon Bowie made up for a 3rd place finish in the shot put with a winning 139-foot throw in the discus to end a winning day for the Rebel boys.